What's the cure for a horrible week at work and dreadful weekend of family drama? 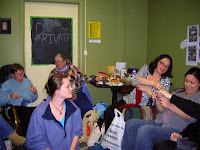 Why a start to the new week with a Knit Night, of course! Tonight was actually my second time as I have actually only attended one other Knit Night. 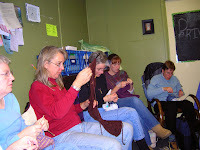 Knit Night is held the first Monday of each month at my LYS, River Knits. Tonight was extra special as it was the Happy Holiday edition of Knit Night that included a Yankee Yarn Swap! Yes that's right, a Yankee Yarn Swap. How fun is that? So, I'm not sure if it's uncommon out here in the Midwest, but apparently not many people out here know what Yankee Swaps are. Maybe it's just more common where I am from. 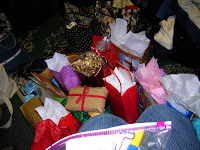 Actually, when you have a group of peeps, it is so much easier, and fun, to have a Yankee Swap rather than buying gifts for each individual. I guess occasionally it's known as a White Elephant, Gift Exchange, Dirty Santa, etc. But apparently a couple of the ladies tonight did not know what a Yankee Yarn Swap meant. Elizabeth, the owner of River Knits, emailed everyone about 2 weeks ago to notify us of the special evening. (BTW, this weekend included a run to Knit Stop, the other LYS that I like. I bought a skein of Malabrigo as I figured if no one else wanted it, I'd take it back -- it was taken and almost fought over). 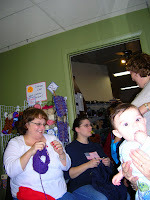 Basically we were to bring in a skein from our stash and wrap it for the swap. So after describing the basic rules we all drew numbers and went at it. A total of 22(ish) people were present. You can't see them all but we were piled on top of one another! 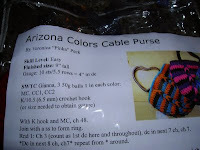 The gift was in a clear zip bag that I figured I could use for travel knitting projects. The pattern is actually a crochet pattern. We'll just keep that in the pattern stash.... But within the clear bag of vinyl goodness was 3 skeins of yarn. 2 skeins of Gianna, from SWTC. These are a 50% Soysilk and 50% Wool blend. 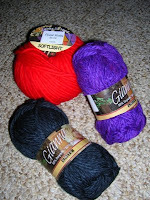 One black and one purple skein. And we know how much I love SWTC (see earlier project, arm warmers in Girlieflauge). And there was also a skein of Laines DuNord, Softlight. It is a fine merino. Very squishy and soft! Overall a very fun night and lots of goodies all around! Oh, and speaking of SWTC, today I wore my arm warmers. Of course my peeps at works picked on me all day about these babies. But dude, my arms and hands were toasty warm, and I think it was totally cute! If you could photoshop out the electrical outlet in the background, the pic of your bunny looks like it could be in a calendar. After reading your description, I'm really sad I haven't been going to knit night! Holiday Cards - Made and Sent! It's happened! I've been injured by my knitting! And once again... I start a fashion trend! Santa Bunny you're the one!